NASA's Scott Kelly (right) and cosmonaut Mikhail Kornienko (left) will fly to the International Space Station for a yearlong stay in space on March 27, 2015. 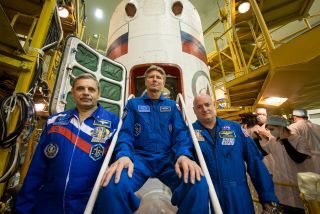 Cosmonaut Gennady Padalka (center) will join them on the station for about six months. Officials hope that the one-year stint on the space station by astronaut Scott Kelly and cosmonaut Mikhail Kornienko will provide them with valuable health data that may help when the space agency decides to send humans to Mars sometime in the future, a major goal for NASA. Scientists have collected a lot of data about how the human body behaves after six months in orbit on the space station, but what happens to a person after a year in space? "Humankind is not going to limit itself with just near-Earth orbit," Kornienko said in a video interview on the one-year space mission. "We need to explore new planets, our solar system. It is inevitable. And the one-year mission is the first step in that direction." At the moment, humans don't have a way to get to Mars that won't take more than a full year, so learning more about how the body behaves in weightlessness for extended periods of time is key in order to safely send people far into space, NASA said. Kornienko and Kelly will take part in a series of joint experiments to help scientists gather a plethora of data on how to mitigate the harmful effects of a long-term stay in space. For example, the two station crewmembers will monitor their eyes to learn more about how fluid distribution in the body can change the shape of an astronaut's eyes while in space. Officials have noticed shifts in astronauts' eyes on previous flights, but NASA isn't sure what happens after 12 months in space versus six months. Mission controllers will also have to keep a close eye on how Kelly and Kornienko retain muscle mass and bone density during their time in weightlessness. Crewmembers on the station for six months at a time exercise for about two hours every day to avoid muscle atrophy and loss of bone density. Officials now want to know how a specialized workout regiment helps crewmembers on orbit for longer than six months. The two crewmembers in the yearlong mission will also participate in various experiments to check out how they are standing up to the psychological rigors of a long spaceflight. "If we're going to go to Mars, we need to understand how the human body reacts in space for longer periods of time," Kelly said in the video. Kelly's identical twin, former astronaut Mark Kelly, will also participate in experiments on the ground to help scientists learn more about Scott and the way his body changes in orbit. Researchers are planning to collect samples from the Kelly brothers during and after Scott's flight to compare the microbes living in their gastrointestinal tracts, according to Northwestern University, one of the schools aiding in the twin science. Scientists will use DNA sequencing to understand what is living in the GI tracts of each of the brothers, and researchers also plan to perform a study in mice that will run in tandem with the human research, Northwestern added. "The study is one of the first to examine how living at zero gravity for a year affects a human's gut microbiota," Northwestern representatives said in a statement. "The findings will help scientists better understand the role of microbiota in human health and disease." Visit Space.com on Friday for complete coverage of Kelly and Kornienko's launch on their one-year space mission.